A custom line of control panels, specifically designed for cooling tower applications. Each application is engineered to be as dependable and reliable as possible. 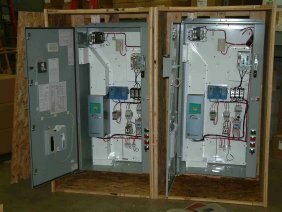 Check out a sampling of the out Inteli-Tower Control panels. Start-up and training can be performed by our experts. Check out our full line of INTELI-TOWER CONTROL panels: Full control panels specifically designed for large cooling towers and automation. From complete internal monitored and regulated panel designs to integrated customer terminal connection, externally regulated by the customer’s own energy management systems. Variable frequency drives with electro-mechanical back-up or supplemental starters are integrated into the most dependable control panels on the market today. Let us work with you in designing a custom solution for your business.